Regular dental cleanings are performed in order to prevent tartar and plaque from building up to extreme levels in patients. When these dental cleanings are avoided, the plaque and calculus can get below the gum line and to the roots of the teeth where brushing and flossing can no longer be used to remove them. At this point, only a dental deep cleaning will be able to help remove these dangers and save you from issues like gum disease and tooth loss. Take a moment to learn more about dental deep cleanings below to see if these procedures are right for you. A deep cleaning, also known as a scaling and root planing, is a procedure that is utilized when a patient has severe pockets in their gums. These pockets collect bacteria which then can lead to severe tooth loss and gum disease. It is important that once you receive this procedure, that you maintain your oral health through regular brushing and flossing at home as well as regular dental cleanings at our office. Is a Dental Deep Cleaning Right for You? Bone loss observed via x-rays. A deep cleaning is done in two parts. In the first part, the scaling, after a local anesthetic is applied, the tartar and plaque are removed from the teeth’s surface and in the pockets located between the gums and teeth. After that is completed, the second part, the root planing, can be performed. A scaling instrument allows for tartar and plaque to be removed from the roots of your teeth. Ultimately, a dental deep cleaning takes two office visits to complete with a third one often being scheduled as a follow-up to see if your gums have begun to recover and no pocket depth is found. A dental deep cleaning is utilized when bacteria is so rooted in the mouth that it can’t be removed through brushing and flossing alone; they’re ideal for patients who have not been to the dentist long time and have that buildup of plaque. If you want to receive a dental deep cleaning or another procedure at Newman Family Dentistry, then you may request an appointment by phone or online. Any questions regarding dental deep cleanings or other services offered by us, please contact us during business hours as we are happy to help you. 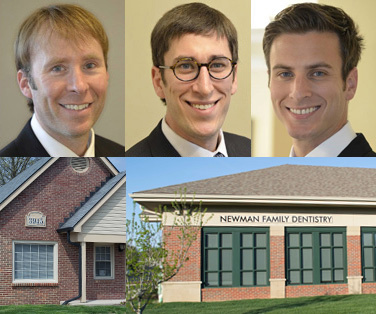 Newman Family Dentistry is proud to have two locations available to treat patients all across the great state of Indiana; our primary concern is ensuring you receive the dental care you want and need!